Rusia Bradus is an Imperial noble, and the master trainer in Athletics. Silgor Bradus is her husband, but you never get to meet him, because he is a general in the Anvil military, and is currently out on patrol near Valenwood in the Anvil County. Rusia lives a most secluded existence and rarely leaves the house. She wakes up at 6am and spends all morning and most of the afternoon wandering restlessly around inside, interrupted only by a two-hour lunch at noon. At 4pm, regardless of weather, Rusia finally leaves the house and strolls around near the Anvil Dock Gate until 6pm when she returns to her house for dinner. At 8pm she resumes her lonely wandering until she goes to bed at midnight. She will offer services at all times, except when sleeping and eating. Note that entering the house always counts as trespassing. She wears a set of middle class clothing consisting of a burgundy linen shirt, burgundy linens, a pair of doeskin shoes and a piece of leveled jewelry. She also carries her house key and a small amount of gold. When you first talk to her, she'll introduce herself, or rather, her husband: "I'm Rusia Bradus. My husband is General Silgor Bradus, one of County Anvil's commanders in the field." When asked about Anvil, she'll reply: "My husband is down south in Anvil County, working the Valenwood line, hunting down bandits and smugglers." When you have reached a skill level of 70 in Athletics, two people can point you toward Rusia for training. On the Anvil Dockside, Hauls-Ropes-Faster will say: "I can't teach you anything you don't already know. But there is someone who might be able to... You'd never know it by looking at her, but Rusia Bradus did a lot of traveling in her younger days. She must have been in pretty good shape." 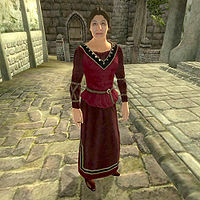 In Chorrol, local hunter and advanced Athletics trainer Honditar will say: "I've heard stories of a woman who traveled the world on foot before settling down somewhere in Cyrodiil... Anvil, I think it was. I believe her name was Bradus? Runia, or Rulia... something like that. If the stories are true, she might be able to train you further.." Both people will, when approached again, repeat: "You should track down Rusia Bradus in Anvil, and see if she can teach you anything more." After you have received the reference to seek out Rusia for training, she may now greet you with: "Is there something I can do for you?" If you ask her about training, she will discuss her early days of traveling while suggesting how you can improve your skills: "Oh dear me, are those old stories still going around? Yes, I did quite a bit of traveling. Back before I met Silgor, and decided to settle down. It's all about pacing yourself. You should get out there, and experience things for yourself. Discover new places, travel to lands you've never seen. Maybe once you've done that, we can talk about how to better pace yourself." After providing you with the task of exploration, Rusia will refuse to offer you training if you ask her about it before discovering at least 30 places: "I think you still need to do some exploring before you're ready to learn more. Discover a few new places on your own, then come see me." Once you have fulfilled her request to explore the world, she will happily train you if you ask her about it, saying: "Well, you do get around, don't you? You've seen a good bit of what the world has to offer, which is more than can be said for most people. All right, I'll teach you what I know about Athletics. Maybe we can swap stories about life on the road." Athletics Training: Prove to an expert athlete that you are well-traveled enough to receive master training.